The Willamette Valley has proven it's mettle as a region that produces world class Pinot Noir, and many say that before too long it's Chardonnay will be similarly lauded. The valley's climate and soil types do indeed bear a resemblance to those elements found in the hallowed grounds of Burgundy. Oregon however has made a style all it's own. The singularity of Pinot Noir's success has been a boon to Oregon's wine industry in the Willamette creating an international reputation. That success however has also led to a homogeneity within the Willamette Valley. Pinot Noir for so many logical reason is by far the most planted grape, and with much of the new influx of California money and size, more Pinot vines are going into the ground all the time. They didn't buy vineyards in the Willamette Valley to produce Riesling. Which is too bad, frankly. Of the over 25,00 acres planted in the Willamette Valley (a number in flux given the rapid growth), well over half of that acreage 15,000 is Pinot Noir, and only Pinot Gris comes close at 3,000. Which actually isn't close. Chardonnay is well underway and in my opinion should eventually surpass Pinot Gris and frankly the sooner the better, and we know that Riesling can do very well in the Willamette Valley. That does not mean however that there isn't some broader variety and if you look around there some really cool stuff to be found. One example of folks going off script are the Single Acre wines from the Stoller Estate Vineyard. On their 190 acre estate vineyard over 120 acres is planted to Pinot Noir, with over 50 acres of Chardonnay. The remaining few acres are split between 5 different varieties with most of it going to Pinot Gris. That leaves us 5 and a half acres to work with and 4 varieties. 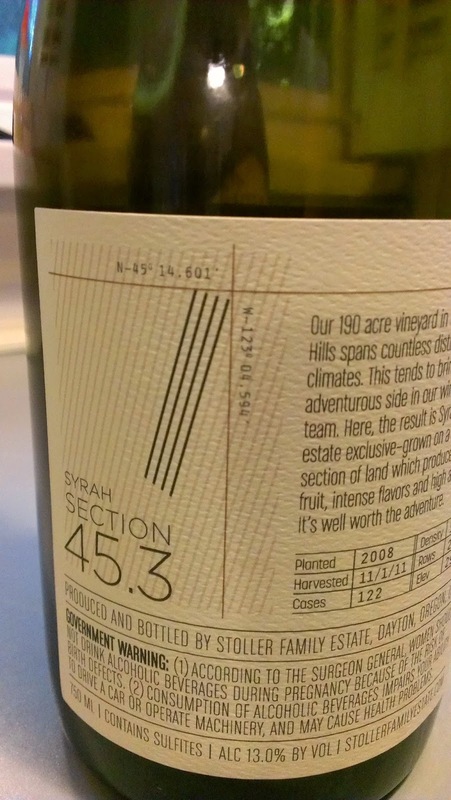 The Single Acre wines at least in this first release, are Riesling, Tempranillo and Syrah, and they give you every reason to be excited about something outside the Willamette Valley box. For Stoller Family Estate winemaker Melissa Burr it's a cool climate thing for all three but perhaps most notably for the Syrah and Tempranillo . "I think our cool climate site makes these varieties serious and less opulent. They are wines that will hopefully age well. I keep both of them in barrel longer than our pinot; approximately 16 months to develop. It will be interesting to see over time how they reflect our vintages that pendulum so drastically from year to year." For Stoller vineyard manage Rob Schultz there are elements of the Willamette Valley's growing conditions that make these outsiders both well suited, and a bit challenging. "I definitely see a role for Tempranillo and Syrah in the valley. I've been very happily surprised with how they ripen here at our estate, and are able to hang late in the season with great disease resistance. I don't think that they're varieties that could be as widely planted as Pinot or Chardonnay; one would definitely need a lower elevation, a warmer spot, and the ability to farm them the right way." "They're challenging because of their varietal idiosyncrasies. For instance Syrah, is more prone to water stress because their stomata, unlike Pinot noir, stay open and the leaves continue to lose water in temperatures above 95. Tempranillo, because the clusters can be so big, requires some tricky canopy management and thinning practices to get a balanced fruit set."